SupViewer is a simple small program to show SUP subtitle files on either a checkered background or a (selectable) graphic. 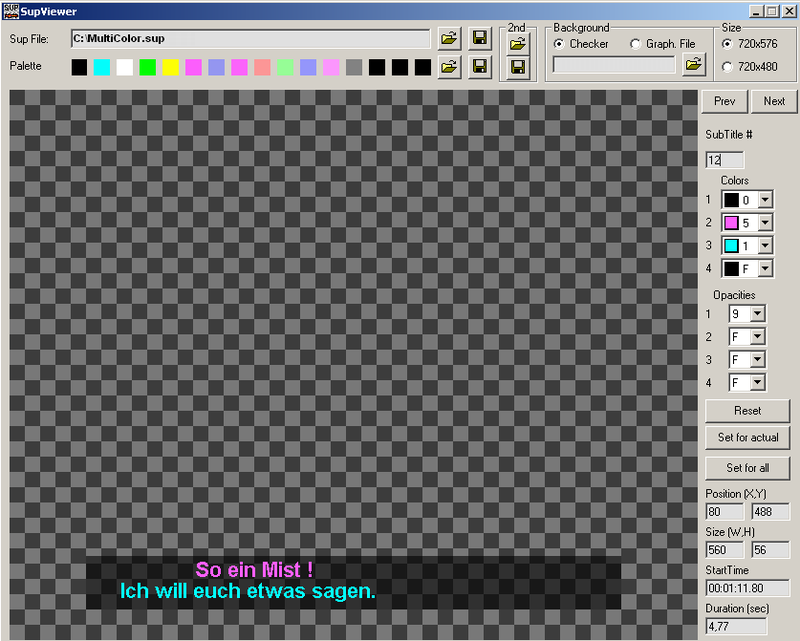 It also allows you to change the colors of the palette and save the new palette as a dvdauthor compatible palette file. Within the SUP file you may change the mapping of subtitle colors to the colors of the palette and also change the opacity/transparency of individual subtitles or for the whole SUP file. The changed SUP file can then be saved with a new filename. The functionality is pretty much like SupRemap or the SUP manipulation tools inside SubtitleCreator, but SupViewer supports variable opacities (or transparencies). SupViewer 0.2 can 'combine' two SUP files to create one 'two language' SUP file which can be used for 'language learning' purposes (usually one language is shown as normal subtitle and the other as 'toptitle').